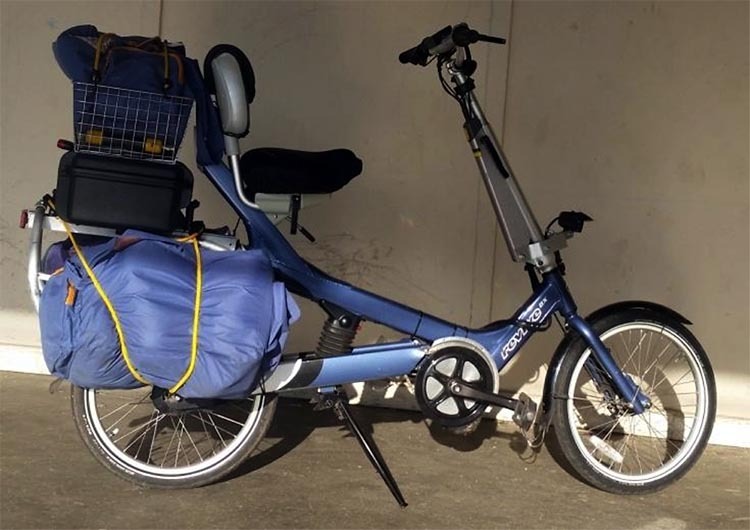 Here is Levin F. Nock’s detailed description of how he converted a comfortable Giant Revive E-bike into an electric cargo bike with a 350W Bafang BBS01 motor. Levin loves his e-bike and uses it to commute, haul groceries, and get some exercise. Over to Levin! My e-bike is an Irish blessing: the wind is always at my back, and the road rises up to meet me. Even with a 20 mph headwind on an uphill climb, the motor makes it seem like the wind is at my back and I’m pedaling downhill. I find this delightfully liberating. When I commute or run errands on this bike, I get some exercise in the process, and I leave a very small environmental footprint. Plus, every once in awhile somebody will call out “I like your bike!” — usually kids, occasionally adults. This is the story of my e-Bike — what I like about it, and how I designed and assembled it. This electrified Giant Revive with 2-foot-long cargo racks is unusually comfortable, safe and versatile. I haven’t seen many e-bikes on the market yet with the combination of pedal-forward upright seating position plus cargo rack, rear backrest, excellent rear suspension, and mid-drive motor, weighing in at under 70 lb. With pedal-assist, I can easily pedal at 20 mph up a gentle slope into a headwind, or haul 3 large bags of groceries (although hauling groceries at a speed of 20 mph is not recommended, since the balance is delicate with a heavy load). E-Bikes of this design might not be suitable for most of the trips that dedicated cyclists already take on bicycles (around 6% of trips in Portland, OR), except perhaps as a way for someone to keep biking after an injury. But safe, comfortable e-bikes like this could be a welcome addition into the lives of the many people who want to include more exercise in their busy schedules, and would bike more often if they felt safe and comfortable doing it (around 60% of Portlanders). With an e-bike, somebody who hasn’t ridden a bike in decades can start biking again for short errands or commuting, without getting exhausted and without taking forever to go somewhere. Navigant Research reports that the global e-bike market will grow from $16 B in 2016 to $24 B in 2025, so I guess I’m not alone in loving e-bikes. The enclosed chain was great for keeping the chain and my clothes clean. Here is a video describing the ergonomic design of the Revive on YouTube. There is only one standard size bike. The seat position and handlebars can be fully adjusted for riders of many different sizes. 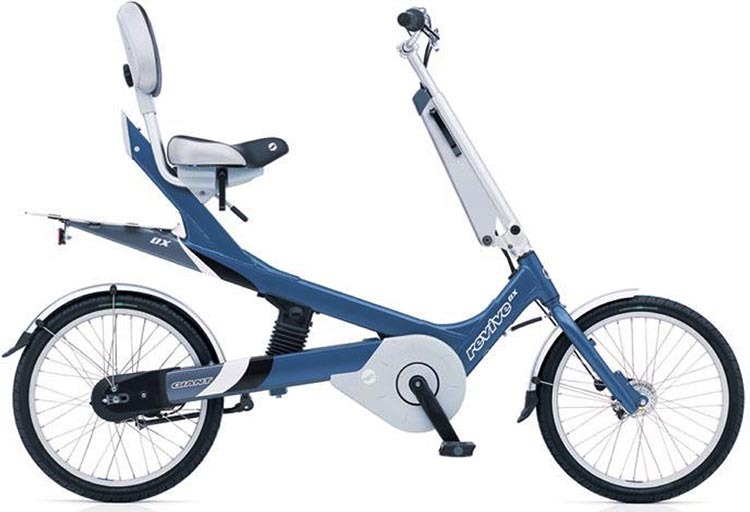 The upright, adjustable pedal-forward seat position with backrest, plus rear suspension, makes the bike unusually comfortable to ride, even if you have a back or neck or wrists that are prone to soreness. With a gel cushion on the seat, and another gel cushion on the backrest for lumbar support, it’s even more comfortable. Like a recumbent bike, you push against the backrest when pedaling hard, so the force applied to the pedals depends on the weight that you can leg press – not by your body weight like a conventional bike. The step-through frame is easy to mount and dismount. The rear suspension smooths out rough roads very effectively, without any ‘pogoing’ from the pedal cadence. The Revive design supports safety as well as comfort. With the upright seating position, my eyes are level with drivers of SUV’s and small trucks, with better visibility than most car drivers or recumbent cyclists. Since my spine is vertical, there’s no weight on my arms. I can look forward and side-to-side very easily, without any strain on my neck—unlike many conventional bikes, especially those with dropped handlebars. With the pedal-forward design you set the seat height for optimal pedaling, and yet when you stop you can set your feet squarely on the ground rather than balancing on tiptoes. 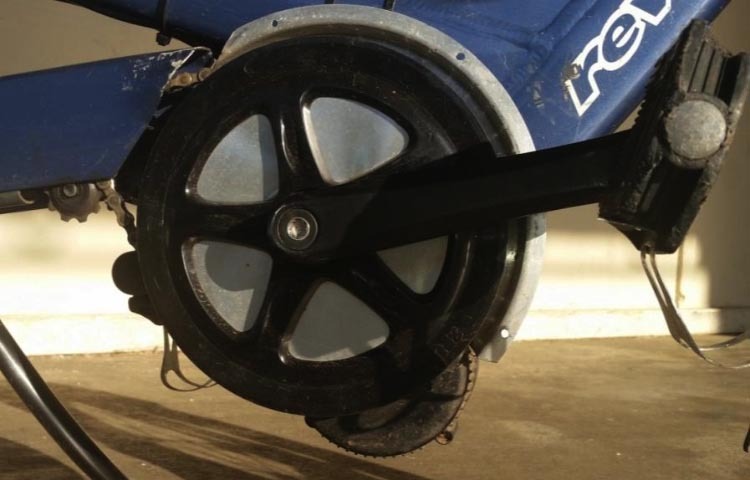 The roller brakes work smoothly and reliably in wet and dry conditions, with minimal maintenance. I can brake very quickly without any danger of flying over the handlebars or losing traction. When I stop suddenly, I simply get pushed forward toward the handlebars, so I’ve learned to push against the handlebars as needed. I’ve only ever lost traction while braking on surfaces that were extremely slick, such as wet leaves or ice. 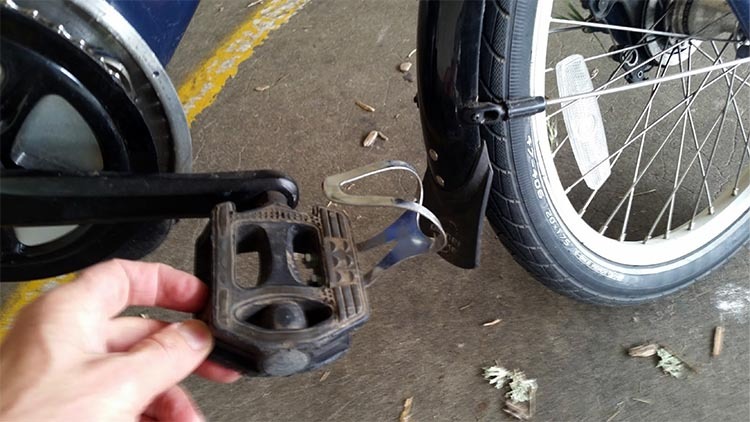 Many years ago when I rode a dropped-handlebar touring bike, I paid careful attention to my gripping pressure on the brake levers for the front vs. the rear brakes, and shifted my weight aft when braking, so I could brake quickly without tipping forward onto the front wheel. That’s never an issue with the Revive. 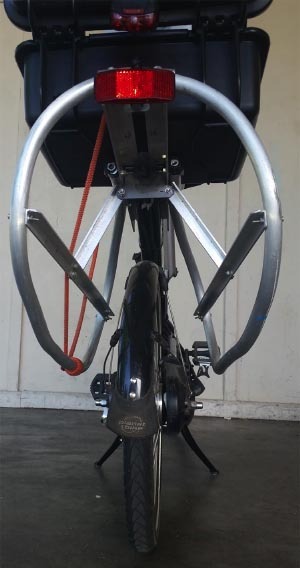 Unfortunately, by including all of those great ergonomic features in the bike design, a side effect was that the stock Revive is heavy (49 lb with the internal gear hub, without the motor) and slow, with high wind resistance from the rider’s upright position. For some reason, I haven’t seen any Giant advertisements that mentioned that☺. After I bought the bike, without a motor, I commuted an 11-mile round trip occasionally, once every week or two. My one-way commute time doubled from 30 minutes of walking/public transit to nearly an hour door-to-desk, depending on weather. For safety and low stress, I chose a circuitous route along quiet residential streets where possible. I could shorten it by riding bike lanes sandwiched between parked cars and busy arterial traffic, but that’s not my idea of a good time. Some of my route is along designated “bike boulevards”, but there are still a few dozen stops along the way, so I’m constantly braking and accelerating. (The City of Portland aspires to turn the stop signs on more bike boulevards in favor of cyclists, but this process is proceeding slowly in my neighborhood of NE Portland.) I would arrive home exhausted, and I’d only use gears 1, 2 and 3 out of 7. I got tired of being the slowest cyclist on the road, but I didn’t invest the time or effort to commute frequently enough so that I’d build more strength and get faster. I considered adding a hub motor, but as far as I could tell, at that time hub motors were available in 3 basic varieties: helpful at slow speeds; or helpful at fast speeds; or large and heavy and expensive with a huge battery. I wanted help at all speeds from a relatively lightweight setup, so I wanted a mid-drive. When I first started looking for a mid-drive motor a few years ago, the options were limited. Then I learned about the Bafang BBS01 motor on EndlessSphere.com (Thanks, Endless Sphere!!!). 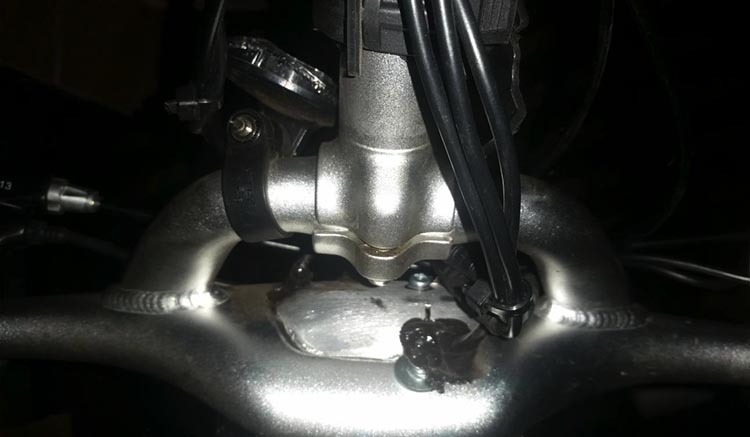 I didn’t know if the motor would work for my bike, because the Revive’s enclosed chain leaves minimal tolerance to change the position of the front chain ring. I checked the BBS01 schematic very carefully, and realized that I could probably make it work, so I bought the motor with my fingers crossed, with a 42-tooth chain ring to match the stock Revive chain ring. I am pleased to report that the motor actually fits, after a few modifications to the bike. A stock Revive has a bottom bracket lip protruding a few millimeters beyond the sides of the frame components, on both sides. I ground off the lip on the right-hand side of the bottom bracket, and added a large washer to the left side, to position the BBS01 chain ring farther to the left. In relation to the chain enclosure, the chain ring is still slightly too far to the right, even after grinding the bottom bracket, because I didn’t want to grind into the main frame components. 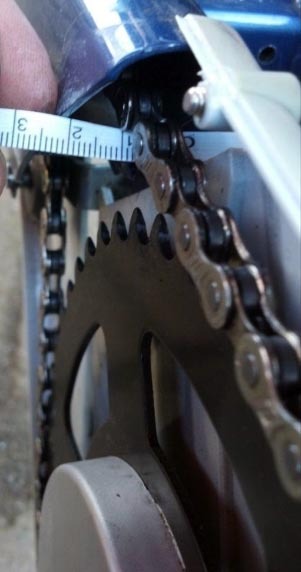 So I enlarged the front opening of the top chain enclosure, and added some washers to the guide sprockets, to align the chain more precisely side-to-side within the chain enclosure. Washers on the inside of the front chain tensioning sprocket keep it farther out, to the right, so it can catch the chain coming from the chain ring. Washers on the outside of the rear sprocket move the chain to the left, within the enclosure, to keep it from hitting the inside of the enclosure. Here is the top front chain enclosure opening, after I enlarged it to add clearance on the outer edge. 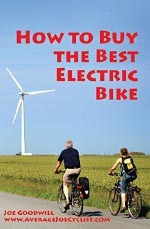 At the time that I bought my 350W Bafang BBS01 motor, the closest vendor was lectriccycles.com in Arizona. Since then, ebikestore.com in Portland, OR has begun to offer merchandise from lectriccycles. If I built another bike, I’d buy from Ebike Store since they’re local. In any case, the motor itself is made in China. Apparently the company has been sued in Europe for patent infringement of a Japanese design. Since the Japanese product isn’t available at all in the US, I don’t feel bad about buying what might be a knockoff. I’m just grateful that I was able to buy a motor from somebody. I’ve heard that Bafang bottom-bracket motors like mine have a few failure points. An O-ring on the crankshaft and a nylon gear wear out eventually. The nylon gear can get stripped on an extremely long hill, or from a rider who rarely pedals and rarely shifts down from high gear. I usually pedal along with the motor, and I usually start off from 2nd or 3rd gear, and then shift up to 5, 6 or 7, rather than starting above 3rd. I haven’t had any problems after 2,800 miles with many, many starts and stops. Someday I might need to replace the O-ring and nylon gear inside my BBS01, and also replace my lithium battery, but for now they’re working great. Now my one-way commute time is around 30 to 40 minutes. That’s slightly longer than the public transit alternative, but cycling is better exercise, less expensive and way more fun, compared to paying $5/day to walk to and from a MAX train that’s usually packed full of people at rush hour. By sticking to quiet residential streets, I am almost never affected by rush hour traffic. The few times that “traffic” has ever slowed me down were for Phys Ed events in Grant Park, when I’ve waited a few seconds while flocks of kids run by. Giant once built a limited-edition electric Revive model called the “Spirit”, with an electric middrive motor tucked neatly up behind the bottom bracket. In contrast, the Bafang BBS01 motor protrudes down below the chain ring. It’s less objectionable than I expected. If Giant or somebody ever decides to build another production bike like this, the Bafang motor or something similar like a Bosch motor, could be modified to fit behind the bottom bracket without protruding down, like on the Revive Spirit. Other versions of the Bafang motor are available. For the first few weeks of riding, I wished for the more powerful BBS02 500W or 750W. But after I learned how to manage the settings, throttle and gears properly, and got a few weeks of regular biking exercise, I’ve been happy with the 350W version, since I don’t normally encounter any long and steep hills. Provided that I pedal, 350W is OK for hills that are either long or steep, just not both at once. I usually keep the pedal assist level maxed out at 9, but if I want a harder workout or a more leisurely ride then I reduce the pedal assist down to 8 or 7. I also use the throttle for a few seconds when starting from a full stop, because when you first start pedaling, the pedal assist has a delay before it kicks in. Oregon has a 20 mph speed limit on electric assist bicycles, so I keep the governor set there. The Bafang BBS01 takes me to 20 mph easily and quickly, when I pedal along. Bicycles in Oregon are allowed to go faster than 20 mph, provided that the motor is turned off. I’ve found this speed is plenty for the residential streets where I ride whenever feasible, and for the stock brakes on the Revive. Theoretically, the Revive could be outfitted with a full set of lights and mirrors, so it could be licensed and insured as a moped legal up to 30 mph, or motorcycle for higher speeds. If I did that, I’d add a front suspension fork, and swap out the wheels/brakes/tires for heavier-duty parts from a BMX bike, mini-bike or moped. BMX 20” rims are slightly larger than the recumbent 20” rims on the Revive. 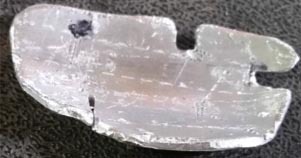 And, apparently the Revive “20-inch” bicycle wheel is the same diameter as a moped “16-inch” wheel, because bicycle parts are measured at the outer edge of the tire, and motorcycle parts are measured at the wheel rim. While it’s legal in Oregon to ride a moped in a bike lane or bike path while you’re pedaling, I personally like being able to park at bike racks on sidewalks, not bother with a license or insurance, and not worry about being caught with an illegal hotrod e-bike. For a moped version of the e-Revive, you’d probably want a larger motor such as the 750W or 1000W BBS02. The frame and shock absorber would also benefit from some stiffening for higher speeds. Crashes below 20 mph tend to cause temporary inconvenience. Crashes above 25 mph tend to cause permanent disability or mortality, unless major armor and impact control are involved; or the participant has the physical conditioning and reflexes of a ninja. Clothing appropriate for 30 mph includes a motorcycle helmet plus padded leather or motocross armor. 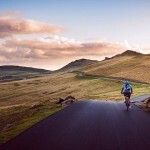 Since I want to get vigorous exercise from pedaling, thermal regulation with motorcycle gear would be more challenging than with lightweight cycling clothes suitable for 20 mph. So, I could go a little faster on a moped version, but I’d want to wear heavy protective clothing, so I’d probably get less exercise. 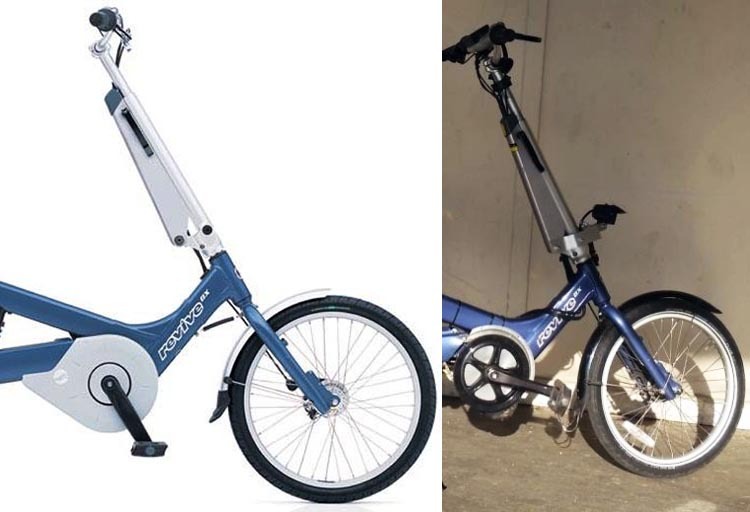 At around 65 pounds, this is not a lightweight bicycle, but it’s considerably lighter than a conventional electric scooter/moped at 200+ pounds. I usually lift the front or rear wheel individually, but I can lift the whole bike if I’m careful. A conventional moped might feel more stable when fully loaded with the equivalent of 3 or 4 normal grocery bags (if that much cargo would actually fit on a moped), but few mopeds seem to offer a comfortable pedaling position plus rear suspension, for comfortable exercise while riding. 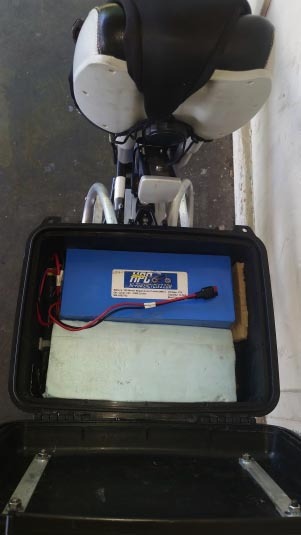 The battery is 36V, 12.5 Ah Li NMC from Hi-Powercycles. At the time that I bought it, Lectriccyles didn’t sell anything similar, although they carry a comparable product now. The battery easily covers my 11 mile roundtrip commute. The battery range covers 2 roundtrips in the summer, but only 1.5 roundtrips in the winter when the battery’s cold (and a fraction of a round trip is a drag). I used to charge the battery every other night in the summer, but after a few times when I forgot to charge on the second night and rode the third day with a low battery, I’ve taken to charging the battery every night, because it’s easy to remember. The battery cost a little over $600. Buying the battery is like prepaying for fuel. I’ve prepaid most of my fuel cost for 3+ years of operation, in the $600 initial battery cost. I needed a waterproof system for winter cycling in Portland, OR. The Bafang BBS01 motor, wiring, and controls are all “highly water resistant”. I’ve never had any trouble with wet weather, but to be on the safe side, I avoid dunking the motor in deep puddles. The waterproof connectors on all the control cables work very well, although the motor did not have a stock waterproof connector for the power cable. 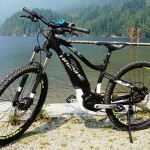 At the time that I purchased the motor and battery, I couldn’t find a waterproof battery holder for e-bikes, or a waterproof battery cable connector. So I bought a waterproof locking Seahorse SE-520 carry case, cut off the handle, positioned an XT90 battery cable connector from Hobby King inside the case where it won’t get wet, drilled some holes for cables and bolts, reinforced the bolt holes with aluminum bars on the inside of the case, and caulked all the holes with silicone. The battery is long and thin, but most waterproof cases are not. In order to hold the long, thin battery, this case is larger than it needs to be in 2 out of 3 dimensions (since I couldn’t find a smaller one). It could hold 3 or 4 batteries if I wanted extended range. Four batteries would provide 100+ miles of major assist in warm weather, or even farther with moderate assist. The battery case is mounted behind the seat, on an extension of the bike frame made from aluminum angle bars from Home Depot. The bars are longer than the stock cargo rack, which I removed, and bolted to the same four threaded holes in the frame that held the stock cargo rack. The extra space inside the locked battery case is a convenient place to carry a few tools, zip ties, and bungee cords. A basket on top of the battery case can carry a jacket, backpack, gym bag or bag of groceries, although the bike gets tippy if there’s substantial weight in this basket. When the bike is parked in a secure location, the basket is a convenient place to leave my helmet and biking gloves. 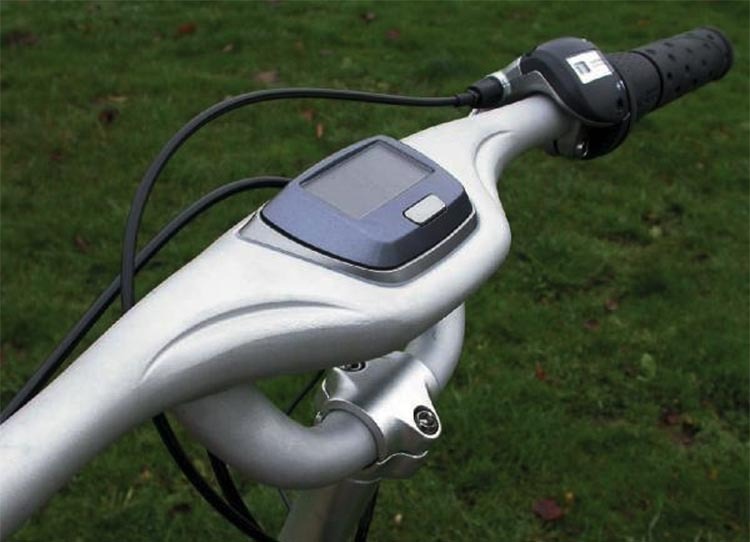 The Bafang display panel is designed to clamp onto the top of a standard handlebar. The Revive handlebar has space near the grips suitable for clamps, but the center of the handlebar is too large for clamps because a stock speedometer display is there, as shown below. When I first installed the Bafang display, I clamped it near the left handlebar grip, but the handlebar looked cluttered. Eventually I replaced the stock speedometer display with the Bafang display, attached to an aluminum plate on the underside of the handlebar. Took some trial and error, but eventually it worked. I added black caulk around the edges of the display, to give it a finished look and to keep water out of the hollow handlebar. The bike has 2 very bright LED headlights. My goal was to mimic an asymmetrical low beam car headlight pattern, lighting the road ahead with minimal glare for oncoming traffic, as shown in the diagram below. For the long range spotlight, a rechargeable, removable NightRider 250 flashlight is attached just below the handlebars. I can adjust the angle as needed while riding, to angle it up straight ahead when riding alone on dark paths, or angle it down when I’m in traffic. 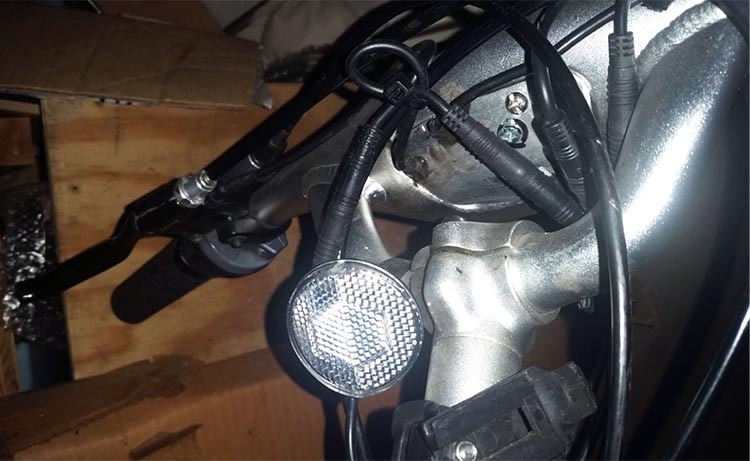 In addition, a motorcycle-style flood light (30 degrees vertical, 60 degrees horizontal, elliptical VisionX Solstice XIL-S11e3065) is wired to the battery through a water resistant pushbutton switch (040-LS-B from TrailTech.net) mounted on the battery case. 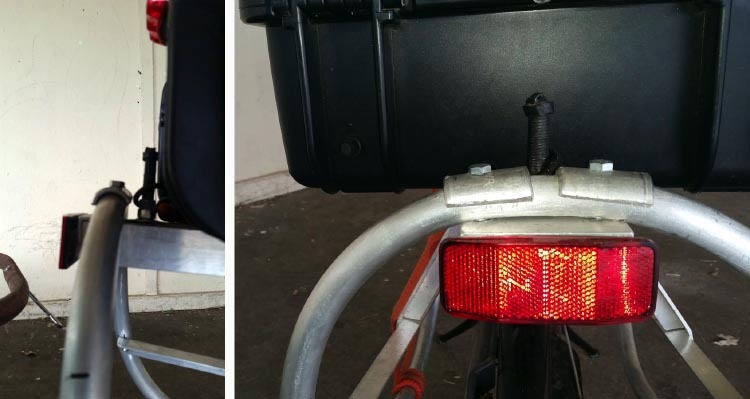 This light is attached just above the front fender, on an aluminum mounting bracket attached with new bolts through stock holes in the handlebar assembly. The flood light accepts DC voltage of 9V to 48V, so it runs OK on my nominal 36V battery (actual voltage 40V fully charged, 32V discharged). In terms of power draw, the motor is rated at 350W, and the headlight is rated at 10W, so most of the power in the battery goes to the motor. After getting angry comments from a few oncoming drivers about my bright headlights, I added hoods to both headlights, to limit the uplight. I want to light the roadway and be visible, without blinding people. The hoods were intended to be temporary models made from black “Gorilla” duct tape, to help me design the shape of new aluminum parts. The tape works so well that I haven’t replaced it with aluminum. With the hoods, the headlights do not illuminate tall road signs, but I have a small flashlight on my helmet that works well for that. I’ve considered adding a second VisionX light with a spot beam (XIL-S1110) to replace the rechargeable NightRider. However, the floodlight flickers sometimes when I engage or disengage the motor, so I need to resolve this issue before adding a spotlight that might also flicker. Probably needs a big capacitor. Compared to a conventional bike, the Revive’s pedal forward design leaves more clearance under the seat for cargo. To add serious cargo space to a conventional bike, the rear wheel can be extended backwards with a Long Tail. On the Revive, I installed a 2-foot-long cargo rack without moving the rear wheel at all. Compared to the stock rack, my cargo rack extends roughly 6” farther forward and 6” farther back. Like most of the modifications on this bike, the cargo rack evolved over time. In its current version, the main component is a single 10-foot length of “half inch” aluminum conduit, ordered at the local Platt Electric distributor; plus some aluminum angle bar from Home Depot. Electrical conduit is named by the diameter of wire that fits inside after the conduit is bent, so the outside diameter of this conduit is actually 7/8”. I bent the conduit freehand with a hand bender, so the shape is a bit irregular, but serviceable. It’s bolted to the aluminum angle bars that I had previously installed to hold the battery case behind the seat. On each side of the rack, bungee cords can hold something on the rack. I usually carry a Whole Foods shoulder bag that’s waterproof inside, durable cloth outside, easy to carry off the bike with a shoulder strap, with a zippered side pocket, purchased for under $10 each. Each bag holds the volume of 1.5 to 2 regular-size grocery bags. In heavy downpours the zipper leaks a little, so if something needs to be completely dry, then I add a plastic bag inside (e.g., a ziplock bag for my wallet and phone). In the typical light rain of Portland, the waterproof bag works great by itself. If I added new horizontal side bars near the tops of the racks, to clip panniers onto, then the rack would hold 4 standard bike panniers—2 on each side. I’ve been so pleased with the Whole Foods bags that I haven’t bothered to get 4 new waterproof panniers, or to add horizontal sidebars for panniers. For commuting, one Whole Foods bag easily carries a change of clothes, lunch, and water bottle. 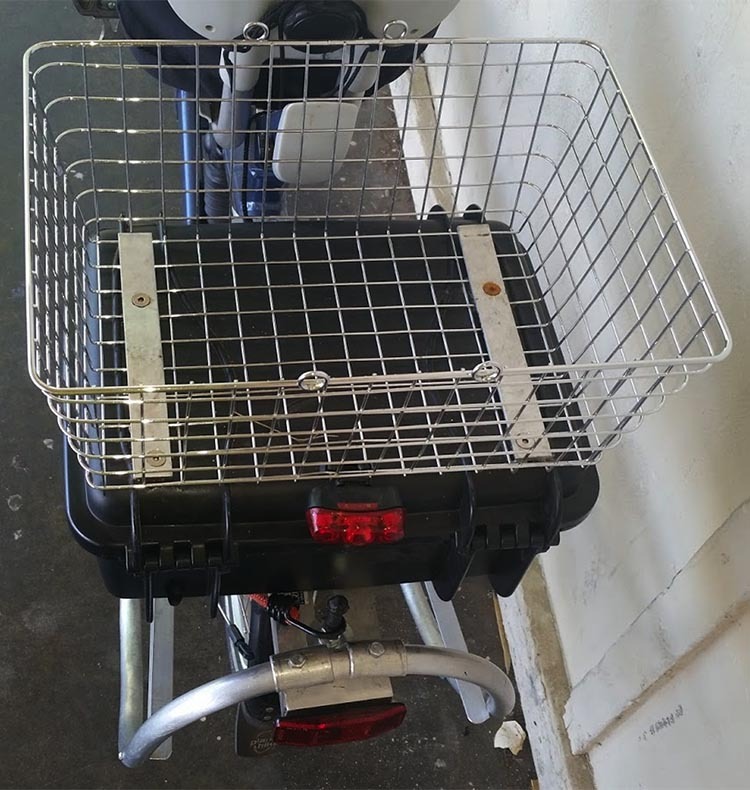 Occasionally I add a laptop in a backpack, which usually goes in the top basket (“Large Wire Basket” by Spectrum Diversified, chromed steel) or on the other side of the cargo rack, to balance the weight more evenly. 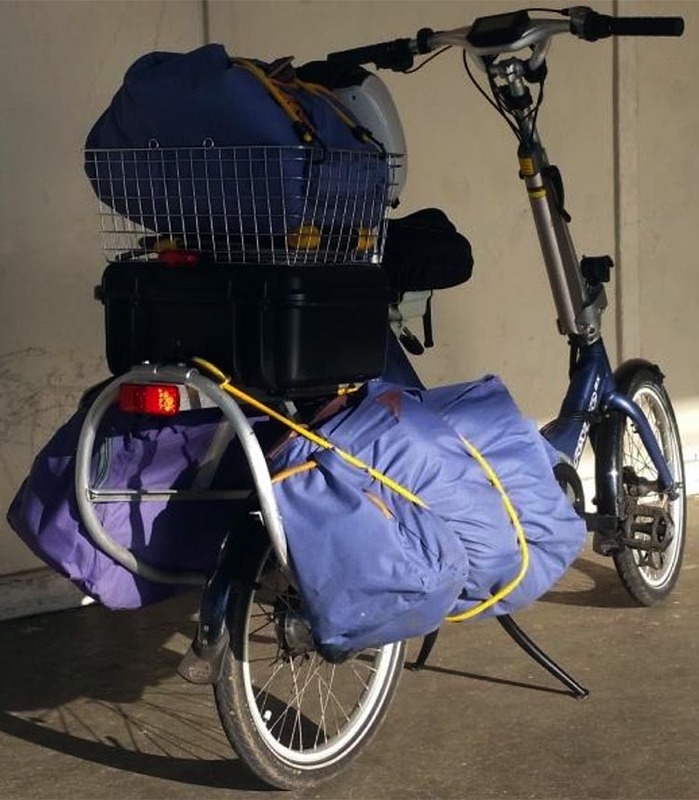 When I planned the rack design, I expected to add fold-down shelves, to provide bottom support for cargo, similar to Xtracycle Wideloader shelves. However I haven’t added shelves because the bungee cords work better than I expected, and I like the clean look of the empty rack without any shelves attached. The Revive is rated at 265 lb rider weight. I weigh around 165 lb, and the battery and motor add an extra 12 lb, so there’s over 80 lb of payload capacity available for the cargo rack. For hauling larger loads (for instance, four Whole Foods shoulder bags fully loaded, instead of two on the cargo racks), I use a lawn cart. It’s noisy when it’s empty; it increases the braking distance and turning radius; and this particular cart looks like it’s sat outdoors for years (because it has). Besides that, it works great. 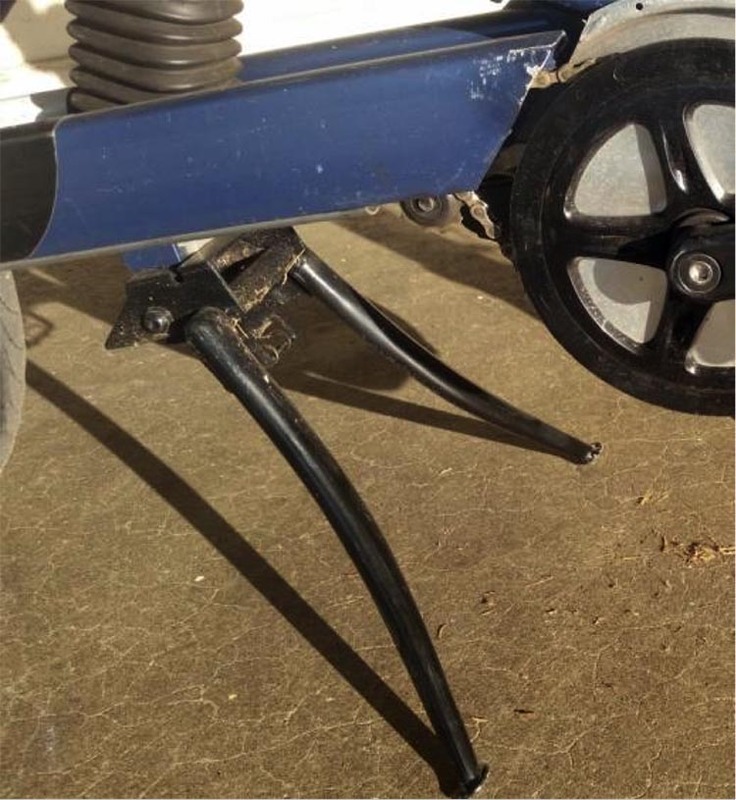 I added an eyebolt to the handle of a lawn cart previously purchased for yard work. The eye of the eyebolt fits over a bolt on the rear of the bike rack that serves double duty as a trailer hitch and a bungee cord attachment. The bolt is covered in heat shrink tubing for aesthetics. 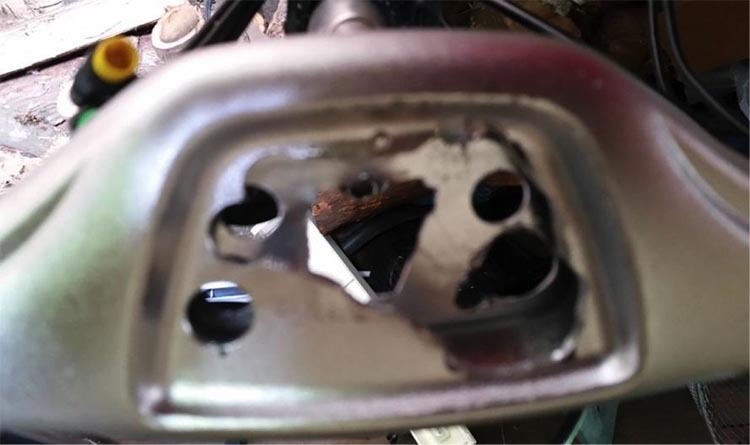 The 2 photos below show the plastic-covered bolt behind the battery case that serves as a trailer hitch and also as a bungee attachment point. If I built another bike with a better cargo rack, I would use a 12-foot length of “5/8 inch” conduit, bent on a custom-built jig, attached to the bike frame before the battery case was installed. 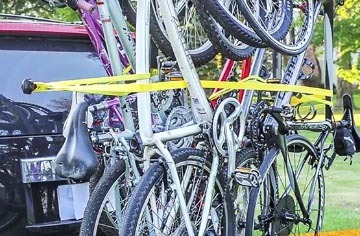 To mimic the Giant Spirit design more closely, a small battery case might fit under, beside, or inside the rear bike frame, below the top of the cargo rack, rather than sitting on top of the bike frame above the cargo rack. 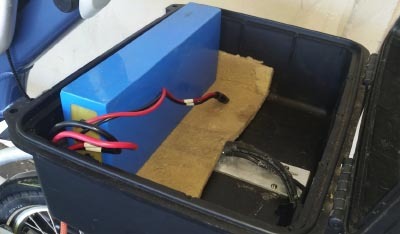 For instance, Lectric Cycles now sells a waterproof, flat battery that would probably fit on the inside of a side rack. That would put the weight of the battery lower, always a good thing for stability. Also, that would enable the cargo rack to hold a set of motorcycle saddlebags or bicycle panniers that are attached together at the top with a handle. 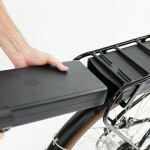 The stock kickstand is insufficient for the extra weight of the battery plus cargo on the rack. 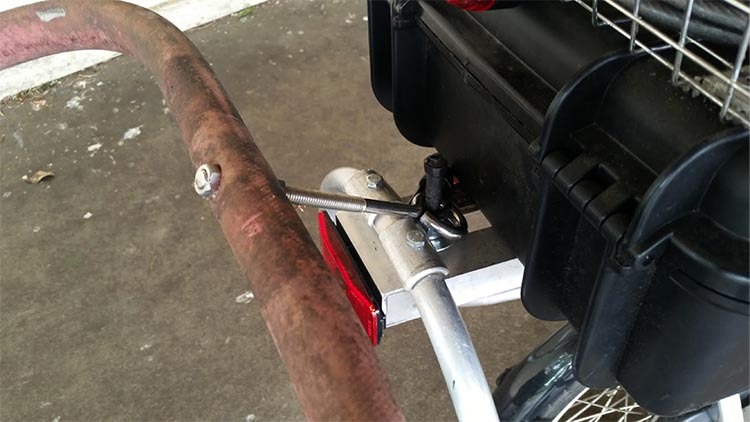 I recently upgraded a lightweight aluminum dual kickstand to a sturdier Yuba Boda steel dual kickstand from Clever Cycles, designed for Yuba cargo bikes. It doesn’t fit on the Revive kickstand mount (no clearance for the rear wheel), but it does fit on the shock absorber bracket, after some modifications. 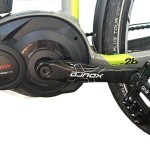 It is solidly built with strong springs, so it doesn’t shake or rattle when the bike is in motion. 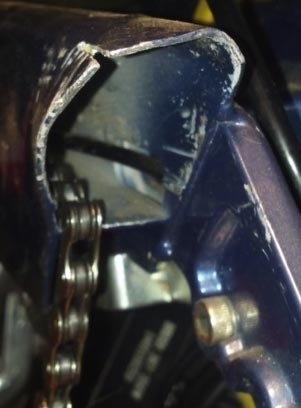 I removed a lip on the righthand side of the kickstand base, to leave clearance for accessing the chain. I also ground down the stops on both sides, to make the kickstand rise higher in the ‘up’ position. The kickstand legs protrude slightly out to each side beyond the cargo rack. Far enough to make kicking up and down easy, but not far enough to cause problems. The stock Revive had a short handlebar grip on the right beside the gear shift, and a conventional grip on the left. The original grips were showing wear (the original bike is 13 years old, after all), so I replaced them both with conventional grips. I like having full-size grips on both sides, especially when I wear snowboarding gloves in the winter. The tires are Schwalbe Marathon Plus, 1.75” wide, with 70 psi on the rear tire and around 30 psi on the front tire. There’s minimal weight on the front tire, and the low pressure helps absorb small bumps. I once got a pinch flat on the rear at a pothole, but otherwise they’ve been trouble-free. The stock Revive fenders were positioned with minimal clearance from the stock tires. I wanted plenty of clearance for larger tires, so I replaced the fenders. On the advice of somebody online with a tadpole, I bought from Planet Bike new 20” fenders with replaceable spokes, plus some 26” replacement spokes, and cut the spokes a bit larger than 20”, for extra clearance. At first, the front fender did not extend forward far enough to redirect the rain. The headlight illuminated the fact that water would come forward from the front wheel, hit the headwind, and then blow straight back at me. So I added a piece of a second front fender to extend the fender farther forward—with one piece of fender in front of the fork, and a second piece behind the fork. This directs the outgoing water downward, for less blowback. In retrospect, I could have cut to size a single rear fender for the front (because a Planet Bike rear fender is longer than a front fender), instead of buying 2 new front fenders to piece together. I like wearing regular shoes for convenient everyday cycling; and I also like having an easy way to position my feet in their optimal position on the pedals. I added steel toe clips that were designed for straps. For safe riding in the city I don’t ever use straps, so I cut off the strap-holders to make the clips easier to enter and exit. I recently added some Nori Lights for nighttime visibility from the side. You put glow-in-the-dark phosphor tape around your rims, then light up the tape with 4 little LED battery pods, one for each side of each rim. They seem to work well, although soon after I installed them, I got a new job where I telework from home, so I don’t have much experience with them yet. What’s Next for my E-bike? After I added the Bafang 350W motor, the stock Giant plastic chain guard covering the front chain ring didn’t fit anymore. I’ve partially completed a new enclosure, with pieces of a circular aluminum cake pan bolted to the Bafang assembly, and a piece of aluminum flashing mounted inside the black plastic Bafang chain ring cover. Someday I’ll get around to finishing the new enclosure, using more aluminum cake pans or maybe 3D printed plastic—then I won’t need to clean the chain as often. Chain access will be more difficult, but that’s ok because it will only need occasional cleaning, and the chain has never derailed since I installed the motor. Because the Revive has 20” wheels and the frame looks unconventional, sometimes people ask if it’s a folding bike. This bike doesn’t fold, but I have some ideas about how to make a folding version, to fit easily on a train or in a car trunk. Another idea, so I can enjoy biking safely for decades to come, would be a trike like those from Tilting Motor Works, to combine the stability of a trike with the excellent upright visibility of the original Revive. I like exploring possibilities and making prototypes. 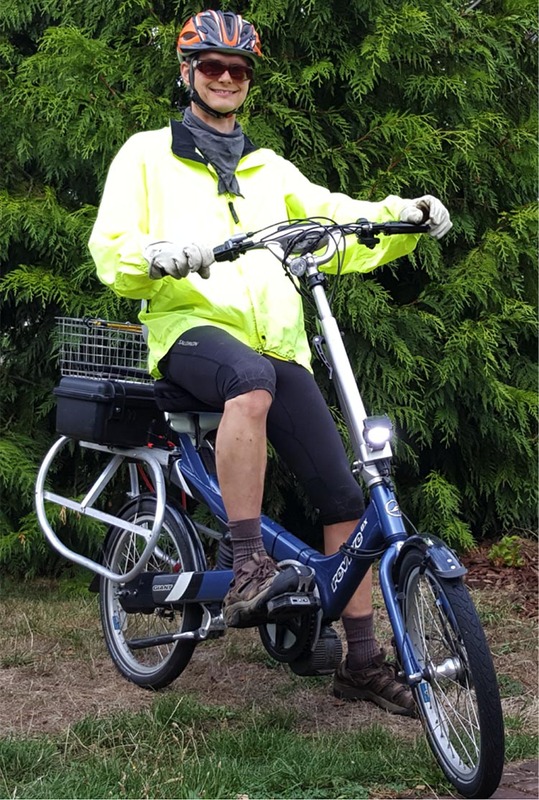 As comfortable, versatile e-bikes like this become more popular, they will help people enjoy gentle daily exercise with a low carbon footprint. If you are commercializing e-bikes and you’d like any advice or assistance, I’d like to talk with you. And I will be thrilled if the Revive ever goes back into production, now that e-bike motor technology has finally caught up with Giant’s visionary design. Thanks to our Guest Poster, Levin F. Nock!